The Quebec Human Rights Tribunal has ordered the Montreal police service and two of its officers to pay a Ghanaian immigrant $14,000 in damages for violating his rights when he was arrested for driving with a burnt-out tail light in 2011. The Montreal police service and two of its officers have been found guilty of racial profiling by the Quebec Human Rights Tribunal and must pay the victim $14,000 in damages. Davids Mensah, who is originally from Ghana, was working as a delivery man for a restaurant when he was pulled over by police in Montreal North on June 4, 2011, for having a burnt-out tail light. He told CBC News that police repeatedly asked him if he had drugs on him and forcefully arrested him without telling him why. He was searched twice during his arrest. "I didn't even get the chance to turn around, and they grabbed my arm, and they smacked my head against my car," Mensah said. According to the tribunal judge, Mario Gervais, the second search was a violation of Mensah's rights. He also pointed to the fact that Mensah was a young black man living in Montreal North. "The questions asked [by the officer] added fuel to the social context of an already highly tense relationship between police and the multi-ethnic community," Gervais wrote in his decision. Gervais also criticized the officers for repeatedly asking Mensah if he had drugs on him. "Both officers could only have known that this question was unjustified, illegitimate, inappropriate and that it would necessarily have a strong impact on the complainant," he wrote. Gervais ordered the SPVM and officers Martin Robidoux and Jean-Michel Fournier to pay Mensah $14,000 in damages. 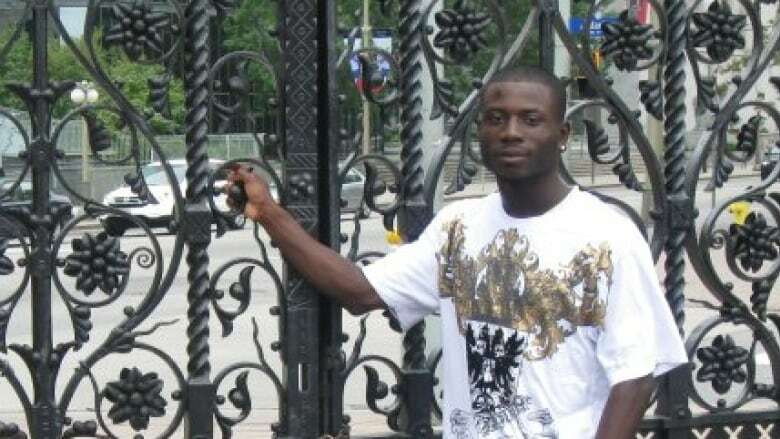 At the time of his arrest, Mensah was studying police technology at Algonquin College in Ottawa. He said following his arrest, he gave up on his dreams of becoming a police officer. "They took my pride away," Mensah said in his testimony. "It took me five years … to be where I want to be. And it took them a couple of seconds to take it away from me." Mensah said that following his arrest, he stayed indoors, keeping lights off and the blinds down. He said he could not sleep or eat. "When I went home that night, I went straight to the basement, and I was crying like a little baby," he told CBC. He continued his studies for almost a year before deciding to quit because he was so disturbed by the arrest. Mensah said he is pleased with the tribunal's decision. "It's not about the money. It's just for them to recognize what they did to me," he said. Contacted by CBC, the SPVM said it is currently reading over Gervais's judgment and will not comment on it. "The force will contact the City of Montreal's legal department before deciding what to do next," SPVM communication officer Sandrine Lapointe wrote in an email. The SPVM has been criticized in the past for inadequately dealing with racial profiling. A report into racial profiling commissioned by the service released in November found the service failed to achieve many of the objectives it set for itself in a plan to address the issue five years ago. The report also found that Montreal police don't have a centralized record of the number of racial profiling complaints. That was something that was recommended in the 2013 coroner's report looking into the death of Fredy Villanueva in 2008.